Sun., Sept. 9, 2018, 9:17 a.m.
A GRIP ON SPORTS • It may not have been officially be Flag Day, but that’s how it felt Saturday around here. Washington State raised its Cougar one in an emotional ceremony; there was a yellow one thrown late in Eastern Washington’s win in Arizona that had heads shaking; and the Mariners seemed to wave a white one. Read on. • Let’s start in reverse order, because that’s how the M’s have been going lately. The poor play led to the inevitable. After a long pregame meeting with general manager – and friend – Jerry Dipoto yesterday, Scott Servais told the media the team’s prospects were going to start seeing a bit more time. If that’s not waving a white flag, I don’t know what is. 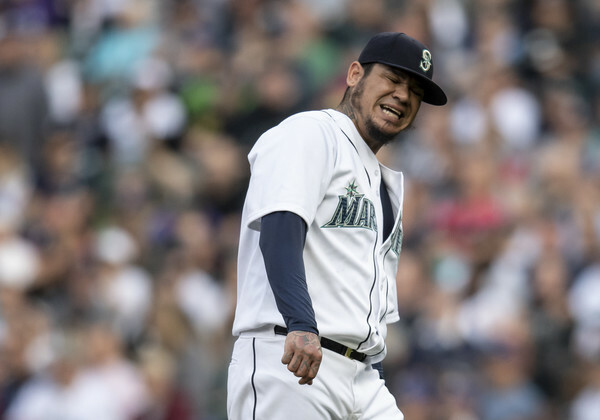 It was good run while it lasted, but as we pointed out in July, the Mariners’ lineup is full of guys who have struggled throughout their career in the second half. The only surprise this year, maybe, is Jean Segura kept hitting. The only two times – including this season – he’s done that in his career, he’s challenged for the batting title. There needs to be some lineup changes made next year. Will there be? • Emotions were running high in Pullman last night even before the football was put in play. It’s hard not to be emotional when the death of a young person is acknowledged in front of some 25,000 people. 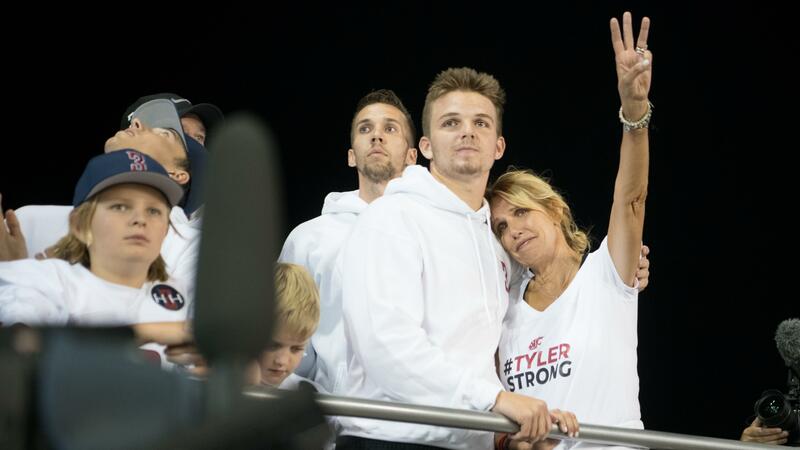 No matter how Tyler Hilinski died, leaving so young is tear-inducing. And no matter how Washington State chose to deal with his suicide, it would not please everyone. That was evident yesterday with the Hilinski family in attendance to raise the ceremonial Cougar flag. Washington State has been forced to walk a fine line, protecting the interests of its student body – there is evidence and research that supports the schools decision to emphasis suicide awareness and prevention while promoting mental heath initiatives – while still trying to honor Tyler Hilinski’s memory. No matter what the school did, someone would feel it was not enough. Last night was the football program’s chance to say goodbye, to say it misses its leader and to look forward to what is ahead. And to focus on helping to ensure such decisions don’t happen in the future. • The targeting rule still is almost impossible to comprehend. And a play late in Eastern Washington’s 31-26 nonconference win at Northern Arizona – two Big Sky schools playing a nonconference game is also hard to comprehend – illustrates it. Dehonta Hayes won’t play the first half next week versus Washington State. The defensive back was ejected in the fourth quarter for targeting, a penalty designed to protect player safety. But a rule that seems to unfairly penalize the defense. It did in this case. Northern Arizona’s Malik Lovette caught a pass on the left sideline and headed upfield. Hayes came up from his secondary spot and lowered his body to hit Lovette low, to catch Lovette at the hips or lower. Yes, Hayes’ head was down. But his intent, obvious on replay to anyone who played it over and over again (guilty), was to hit Lovette in the legs. But before he could get there, Lovette lowered his head and initiated the helmet-to-helmet contact with Hayes. It was a dangerous hit, one that should be penalized. But I’m not sure I’ve ever seen the offense cited for, in this case at least, initiating the illegal contact. The heads made contact less than two feet off the ground. The defender started to go low first. He did not initiate the contact. But the defense rarely receives the benefit of the doubt. I doubt the conference office would get involved and overturn next week’s mandated suspension, even if it can. Which is too bad. WSU: The late start meant a tough scramble for Theo Lawson, Tyler Tjomsland and the S-R desk crew trying to get as much information in the print edition of the newspaper as possible. But we link what appears on the web, with its variable deadline, so it’s a bit more complete. We start with Theo’s game analysis of the Cougars’ 31-0 shutout. We continue with his keys to the victory, the difference makers, stories on the flag-raising ceremony, the defense's stellar effort, the offensive line’s clean slate – Gardner Minshew had a big part in that this week – and Minshew’s ability to run. Tyler has his photo report from Pullman. I added a TV Take from my Laz-e-Boy, with reporting throughout the day. The talented folks in the office chipped in with highlights and more. All-in-all, a complete report. … The volleyball team remained undefeated. … There is also coverage of the game from the San Jose Mercury News. Elsewhere in the Pac-12, the first big conference game of the season took place at Stanford, with the Cardinal defense flummoxing USC freshman quarterback JT Daniels and the Trojan offense in a 17-3 win. … The conference took two bad losses, with Arizona being blown out at Houston in a nationally televised rout and UCLA losing at Oklahoma in another game that was seen everywhere. … The biggest win? That came in Tempe, as Arizona State edged Michigan State. But it came after most fans were asleep. … Colorado’s win at Nebraska will help as the Buffs were helped mightily by the Huskers’ boneheaded penalty late. … Both Oregon and Oregon State took on Big Sky Conference foes and both won handily. The Ducks did it through the air thanks to Justin Herbert. The Beavers stayed on the ground and ran over Southern Utah. … Utah went on the road to the Midwest and had to get a big defensive score late to hold off Northern Illinois. … California is 2-0 after its new look offense had just enough to get past visiting BYU. … Washington handled North Dakota with ease but there is still something missing with the Huskies attack. Gonzaga: The volleyball team had a good weekend. EWU: Ryan Collingwood was in Flagstaff – a beautiful place to be this time of year – and has the game coverage and a notebook. The win should help Eastern considerably down the road, though Northern Arizona’s loss of quarterback Case Cookus may handicap the Lumberjacks in the conference season. … Around the Big Sky, the surprising outcome of the day comes from San Luis Obispo, where Weber State held off host Cal Poly. Not because the Wildcats won, but because it was so close. … UC Davis won again, this time getting a victory against USD. … Sacramento State gave San Diego State all it could handle. … Portland State coach Bruce Barnum was happy to get out of Eugene healthy. … Southern Utah has a tough schedule – and another defeat. … Montana is 2-0 after smoking visiting Drake behind the play of Dalton Sneed. … Montana State, playing without its starting quarterback, struggled at South Dakota State. … Northern Colorado lost its second consecutive game. Idaho: The Vandals were at home and surged past Western New Mexico in the second half for a 56-10 victory. Peter Harriman was in the Kibbie Dome and has this game story. CCS: The Sasquatch men’s soccer team posted a shutout victory. NIC: The Cardinal romped to a women's soccer victory. Indians: It’s an unlikely Northwest League championship series, as Dave Nichols explains. All of the games this week in the series will be Eugene. Chiefs: Riley Woods’ hat trick helped Spokane pound Tri-City 7-3 in preseason play. Preps: The high school sports action doesn’t take Saturday off. There are cross country meets and soccer matches. And a couple football games. … Former Gonzaga Prep swimmer Daniel Roy will be part of the U.S. national team. Seahawks: The season begins today in Denver against the Broncos. What the Hawks will look like, how they will play, it’s all sort of a mystery for the revamped team. I guess we will all find out together. … Earl Thomas is active. Mariners: When the M’s were flying high, the organization gave Servais and Dipoto contract extensions. Is there buyer’s remorse now? … The loss dropped the M’s, well, let’s put it this way: Tampa is now within a half-game of passing Seattle in the wild-card race. … Gene Warnick has this week's Out of Right Field column. We're not throwing in the towel on the coverage just yet. Published: Sept. 9, 2018, 9:17 a.m.